Love it or hate it, these two facts that cannot be denied about the F-35—its F135 turbofan engine is very loud, and its afterburner plume is massive. 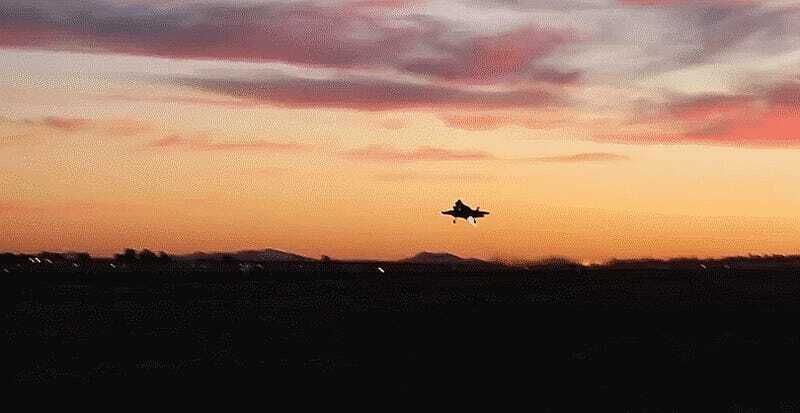 Add in some twilight conditions and you have yourself quite the light and sound show, as can be seen in this video taken at Luke AFB as a bunch of F-35As take to the skies for a night training sortie. Like so many other things F-35, the jet’s powerful engine has been mired in controversy. Originally, there were supposed to be two engines available for the F-35, much like the choices customers of the F-16 and F-15 have today. This alternative engine built by General Electric (the other is built by Pratt And Whitney) was cancelled in the first term of the Obama Administration in order to save money, although the vast majority of its development was behind it. The canceling of General Electric’s F136 engine became a major issue once again when an F-35 caught fire on the runway in the summer of 2014. The fleet was subsequently grounded for months, and eventually the grounding was partially lifted but harsh flight restrictions remained in place. Once the reason for the engine fire was identified and measures were put in place reduce the risk of it happening again, the fleet returned to the air without restrictions. Considering that the Pentagon is already putting many of its eggs in one basket in regards to the F-35 program, paying for the development of an alternative engine seems like a very wise choice, especially considering how little the comparative cost is to finish its development when compared to the whole program. Not only that, but also the fact that competition has proven to be a good thing when it comes to fighter engine options. This is especially valid considering that F-35 already largely represents a monopoly on U.S. fighter production. Another area where the F-35’s engine has caught some flak is when it comes to the noise it puts out. It has been perceived that the stealthy jet’s engine that punches out 40,000 pounds of thrust is louder and more obnoxious in tone than the powerplants in the aircraft it replaces. This has led to noise-pollution fights at bases around the US that the F-35 is stationed at or may be stationed at in the future. Conflicting reports and opinions exist on this issue, with a late 2014 report focusing on MCAS Beaufort stating that the F-35B is slightly louder than the Super Hornet on takeoff but quieter on landing. At the same time, the F-35B’s sonic issues continue to be a problem while operating off of Navy amphibious assaults ships, with a new headset being a possible partial solution to the issue. For the USAF, the F-35's perceived audible footprint remains an issue for many communities, including Boise, Sioux Falls, and Burlington, among many others. In the end, these issues will likely be worked out with noise abatement procedures, routes and time-of-day flying restrictions, but they are just another reminder of just how much of a lightning rod the F-35 has become.